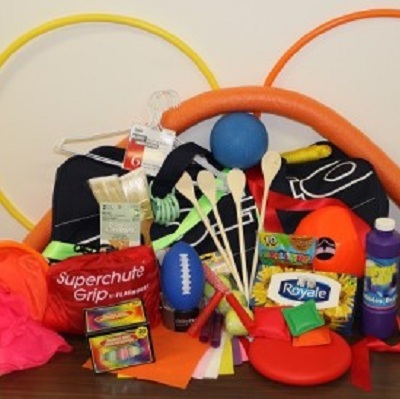 The Active Play Equipment (APE) Kit is full of of tools and materials to use during active play. This bag of goodies is part of the Healthy Start resources offered to centres. It includes the standard balls and skipping ropes but also other materials you might not expect to be playing with like nylons, wire hangers, or a box of tissues…and to help you make your play equipment.